Chop chilli, ginger, onion, curry leaves. 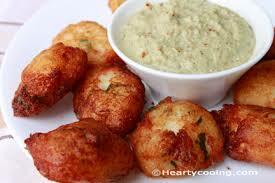 Add idli batter, salt, cooking soda, cumin seeds and maida, mix thoroughly. Heat oil, make balls with batter and deep fry till golden brown (on medium fire) serve hot with coconut and ginger chutney.